Prominent & Leading Exporter from New Delhi, we offer sutent 12.5 capsule, renvela 800, cinasun 30 cinacalcet tablets, cinacalcet tablets, febuxostat zurig 40 mg tablets and ketosteril coated tablets. Renvela (sevelamer) is a phosphate binder. Sevelamer helps prevent hypocalcemia (low levels of calcium in the body) caused by elevated phosphorus. Renvela is used to control phosphorus levels in people with chronic kidney disease who are on dialysis. 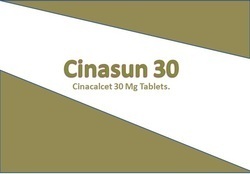 Cinacalcet is used in the treatment of high calcium levels in the blood and hyperparathyroidism.How cinacalcet worksCinacalcet works by lowering a chemical (parathyroid hormone), which makes calcium level go back to normal.Common side effects of cinacalcetNausea, Vomiting, Weakness, Headache, Dizziness, Rash, Back pain, Muscle pain, Upper respiratory tract infection, Dyspepsia, Paresthesia (tingling or pricking sensation), Decreased appetite, Constipation, Decreased blood pressure. What is Zurig 40? 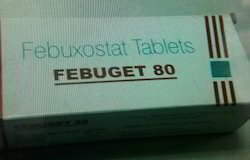 Zurig 40 containing the active ingredient febuxostat belongs to the class of medications called xanthine oxidase inhibitors. It works by decreasing the amount of uric acid that is made in the body to prevent uric acid build up. Controlling uric acid levels in the body can help prevent symptoms of gout attacks such as severe redness, swelling, pain and inflammation in one or more joints. The medication can prevent gout attacks but cannot treat them once they occur. How is Zurig 40 used Zurig 40 is usually taken orally once daily or as prescribed by a doctor. The tablets can be taken with or without food but should be taken with plenty of water to prevent an upset stomach. Dosage will depend on the patient?s condition and their response to the treatment, contact a doctor for the correct dosage. Your doctor may prescribe other medication to be used along with this treatment for the first few months as the risk of gout attacks increases when the excess uric acid is being removed from the body. Adverse effects Zurig 40 may cause unwanted side effects in patients such as: Nausea Gout attack Dizziness Diarrhea Headaches Fatigue Contact a doctor immediately should side effects persist or encounter more severe side effects such as: Difficulty breathing or swallowing Insomnia Muscle spasms Weakness in one side of the body Vision problems Fainting Warnings Immediately proceed to your nearest emergency department if you suffer an allergic reaction. Symptoms usually associated with such a reaction include difficulty breathing or swallowing, chest tightness, swelling, skin rashes, and hives. Zurig 40 is not always suitable for all patients. Always consult your health care provider prior to using this medication if you are pregnant, breastfeeding, trying to conceive, using any other medication (prescription or non-prescription), using any herbal products or supplements, or if you have any allergies or other health problems. The correct dosage and prescription commonly depend on the patient and the condition being treated. Do not adjust your dosage without the approval of your health care provider. This product is only for use as prescribed and instructed. We are distinguished Trader, Distributor and Suppliers of premium quality effective range of Injections, Tablets and Eye Drops. These products are widely demanded for their safe usages and quick result. Looking for Kidney Disease ?